The Burkholderia cepacia complex (Bcc) groups bacterial species with beneficial properties that can improve crop yields or remediate polluted sites but can also lead to dramatic human clinical outcomes among cystic fibrosis (CF) or immuno-compromised individuals. Genome-wide regulatory processes of gene expression could explain parts of this bacterial duality. Transcriptional σ70 factors are components of these processes. They allow the reversible binding of the DNA-dependent RNA polymerase to form the holoenzyme that will lead to mRNA synthesis from a DNA promoter region. Bcc genome-wide analyses were performed to investigate the major evolutionary trends taking place in the σ70 family of these bacteria. Twenty σ70 paralogous genes were detected in the Burkholderia cenocepacia strain J2315 (Bcen-J2315) genome, of which 14 were of the ECF (extracytoplasmic function) group. Non-ECF paralogs were related to primary (rpoD), alternative primary, stationary phase (rpoS), flagellin biosynthesis (fliA), and heat shock (rpoH) factors. The number of σ70 genetic determinants among this genome was of 2,86 per Mb. This number is lower than the one of Pseudomonas aeruginosa, a species found in similar habitats including CF lungs. These two bacterial groups showed strikingly different σ70 family architectures, with only three ECF paralogs in common (fecI-like, pvdS and algU). Bcen-J2315 σ70 paralogs showed clade-specific distributions. Some paralogs appeared limited to the ET12 epidemic clone (ecfA2), particular Bcc species (sigI), the Burkholderia genus (ecfJ, ecfF, and sigJ), certain proteobacterial groups (ecfA1, ecfC, ecfD, ecfE, ecfG, ecfL, ecfM and rpoS), or were broadly distributed in the eubacteria (ecfI, ecfK, ecfH, ecfB, and rpoD-, rpoH-, fliA-like genes). Genomic instability of this gene family was driven by chromosomal inversion (ecfA2), recent duplication events (ecfA and RpoD), localized (ecfG) and large scale deletions (sigI, sigJ, ecfC, ecfH, and ecfK), and a phage integration event (ecfE). The Bcc σ70 gene family was found to be under strong selective pressures that could lead to acquisition/deletion, and duplication events modifying its architecture. Comparative analysis of Bcc and Pseudomonas aeruginosa σ70 gene families revealed distinct evolutionary strategies, with the Bcc having selected several alternative primary factors, something not recorded among P. aeruginosa and only previously reported to occur among the actinobacteria. Burkholderia cepacia complex (Bcc) bacterial species are β-proteobacteria that can be found in various environments including freshwater and plant rhizosphere. They are also the etiological agents of several human infections. This bacterial complex includes several closely related species or genomovars of Burkholderia that can be isolated from cystic fibrosis (CF) patients. These species can also be found in nosocomial infections. B. cenocepacia (Bcen) is a species of the Bcc that can lead to the "cepacia syndrome", a dramatic necrotizing pneumonia (for review see ). Three major B. cenocepacia epidemic clones have been described around the world: ET12, PHDC and Midwest [2–4]. Three strains of these clonal complexes (one of ET12 and two of PHDC) were sequenced by the Sanger Institute and the Joint Genome Institute, and are available on their respective web site. Several other Bcc and Burkholderia strains were sequenced or are in progress of getting sequenced (for a list see ). The ability at colonizing several biotopes is a character observed in the Bcc but also among other bacterial species like Pseudomonas aeruginosa of the γ-proteobacteria. This versatility has been linked to an important diversity of regulatory processes including those of the σ70 gene family . Transcriptional σ70 factors can bind reversibly to eubacterial DNA-dependent RNA polymerase (RNAP) to form the holoenzyme, and enable its promoter-specific attachment. This holoenzyme can drive synthesis of mRNA (but the process could be regulated by several transcriptional repressors  and activators ). Through evolution, selective pressures seem to have favoured the emergence of several paralogous lineages of σ70, and these factors became a central component of bacterial adaptability to changing environments including host colonization. This resulted in the observation of some sort of relation between the lifestyle of bacteria and the number of genes encoding σ70 factors in their genome. For example, 65 σ70 gene sequences were detected among the genome of Streptomyces coelicolor  which is ubiquitous and morphologically complex but only one in Mycoplasma spp. which are host- and disease-specific [10, 11]. Among Pseudomonas aeruginosa, a species sharing several niches with the Bcc, 23 σ70 gene sequences have been reported . Generally speaking, σ70 factors can be divided into four groups according to sequence similarities and promoter-recognition specificities [12, 13]: (1) the essential primary sigma factors, involved mainly in exponential growth, and the alternative actinomycetal sigma factors; (2) the stationary phase factors; (3) the factors involved in sporangium development, flagellin synthesis and heat shock response, and (4) the extracytoplasmic function sigma factors (termed ECF). All these factors are in competition for the same RNAP core enzyme . Genes under the control of a same sigma factor are termed to be part of a same sigmulon. Here, we report the first global analysis of the σ70 gene family among the Burkholderia cepacia complex. The first fully sequenced Bcc genome of B. cenocepacia (strain J2315 of the ET12 epidemic clone) was used as the reference sequence for this study. σ 70 TBLASTN searches of B. cenocepacia strain J2315 (Bcen-J2315) genome sequence were performed. First, searches making use of ten σ70 factors of the main groups of this family were carried out. Then, a second round of TBLASTN searches using all B. cenocepacia factors detected in the initial screening was done. This led to the identification of twenty σ70 gene sequences, thirteen on chromosome 1, seven on chromosome 2, and none on chromosome 3 (Table 1). All genomic regions harbouring σ70 coding sequences (CDS) were analysed by the testcode programme, to identify their corresponding ORF. In the case of the presence of multiple initiation codons, the ORF showing the longest CDS was selected. All the defined σ70 gene sequences and their position on the Bcen-J2315 genome are listed in Table 1. Given the genome size of Bcen-J2315 (8,056 Mb), an average of 2,86 σ70 gene sequences per Mb was computed. This number of sigma genes is slightly lower than the number reported in P. aeruginosa (23 σ70 in strain PA01, genome size of 6,26 Mb) for which an average of 3,67 σ70 genes per Mb was calculated. It is also lower than the one of the genome of Streptomyces coelicolor strain A3(2) (8,67 Mb) which has a similar genome size. However, S. coelicolor has a very distinct morphology (being hyphal and producing spores) and ecology. This simplistic analysis suggests that bacteria like the Bcc and P. aeruginosa, which are sharing several habitats, have similar number of σ70 gene sequences. However, the composition of these families was found to be quite different (as described in the next sections). Distribution of B. cenocepacia J2315 strain σ70 factors among other Burkholderia genome sequences and P. aeruginosa. TBLASTN searches of Bce-J2315 σ factors were performed on fully sequenced Burkholderia genomes. In accordance with phylogenetic inferences shown in Fig. 3 and 4, TBLASTN were considered to reveal homologs or orthologs of a same σ70 lineage when showing identity values above 50% and similarity higher than 63%, and when being part of a phylogenetic cluster supported by high bootstrap values. • P. aeruginosa OrbS homologs, named PvdS, showed 38% identity and 56% similarity with Bcen-J2315 homolog. Sequences were retrieved from [51-54]. Genomes of the following strains were analysed: B. cenocepacia, strains J2315, AU1054, HI2424, PC184 (negative for Bcen-SigJ); B. vietnamiensis, G4; Burkholderia sp., 383 ; B. ambifaria, AMMD, B. dolosa, AU0158; B. xenovorans, LB400; B. mallei, ATCC23344, 10229, GB8 horse 4, SAVP1; B. pseudomallei, 1710a, 1710b, S13, 1655, 668, K96243; B. thailendensis, E264; P. aeruginosa, PAO1, PA14. * indicates an ORF different from the one of the annotated genome. Distribution limited to Burkholderia genomes, see Fig. 4. Translated amino acid (AA) sequences from Bcen-J2315 σ70 coding sequences were positioned among the main eubacterial σ70 lineages, using a decisional σ70 Neighbor-Joining (NJ) phylogenetic tree limited to key sequences (Fig. 1). This phylogenetic tree divides the σ70 gene family into four groups (see ): (1) one grouping the primary (mainly RpoD) and alternative primary actinomycetal factors, (2) one grouping the stationary phase factors (mainly named RpoS), (3) one the heat shock (RpoH), flagellin (FliA), and cellular differentiation (WhiG) factors, and (4) one grouping factors involved in extracytoplasmic functions (named ECF factors). All these groups are supported by high bootstrap values. This phylogenetic tree allowed to allocate 14 of the Bcen-J2315 σ70 gene sequences into the ECF (see Table 1). The ECF group is often the most important in number, and is the main group involved in bacterial responses toward changing environmental conditions. ECF sequences represent 66% of the σ70 gene sequences of the Bcen-J2315 genome, a number which is lower than the one observed in P. aeruginosa (82%) [6, 15]. Two deduced AA sequences, EcfA1 and EcfA2, are 100% identical in Bcen-J2315, and their respective genes are positioned on two identical DNA strands of 40 kb that are diametrically opposed on chromosome 1 (see section on ecfA for further details). For the remaining 6 factors, three were allocated to group 1 (SigE, SigI and SigJ), one to group 2 (SigK), and two to group 3 (SigL and SigM). Allocation of B. cenocepacia strain J2315 σ 70 deduced factors into the main σ 70 gene family phylogenetic groups. All Bcen-J2315 deduced amino acids sequences from σ70 coding sequences were added to the frame of the Lavire et al. multiple alignment. A Neighbor-joining phylogenetic tree was computed from this multiple alignment. Distances on this tree are proportional to evolutionary divergences expressed in substitutions per 100 sites. The Bcen-J2315 sequences were allocated to one of the following phylogenetic groups: group 1, the essential primary factors, and alternative primary factors of the actinobacteria; group 2, stationary phase factors of the RpoS type; group 3, factors involved in heat shock response, flagella synthesis or cellular differentiation, and group 4, factors involved in extracytoplasmic functions (ECF). Bcen-J2315 deduced σ70 factors conserved domains were revealed by CDD analyses (Fig. 2). Four conserved domains (regions 1 to 4) were described  among the σ70 family, with region 1 being sub-divided into R1_1 and R1_2. Bcen-J2315 SigE, I and J contain all four regions. Regions 2 and 4 were identified in Bcen-J2315 deduced SigL, SigM and SigK sequences but only a full region 3 was found in SigM and SigK. Sub region 1_1 was detected in SigK. Only regions 2 and 4 were detected among the ECF factors. Conserved regions among B. cenocepacia strain J2315 σ 70 factors. These regions were detected by CDD (Conserved Domain Detection ). R1.1: region 1.1 can modulate or prevent DNA binding by regions 2 and 4 when the sigma is unbound by the core RNA polymerase; R2: region 2 contains both the -10 promoter recognition helix and the primary core RNA polymerase binding domain. R3: region 3 is primarily involved in binding to the core RNA polymerase. R4: region 4 is involved in binding to the -35 promoter region. The NJ tree of Fig. 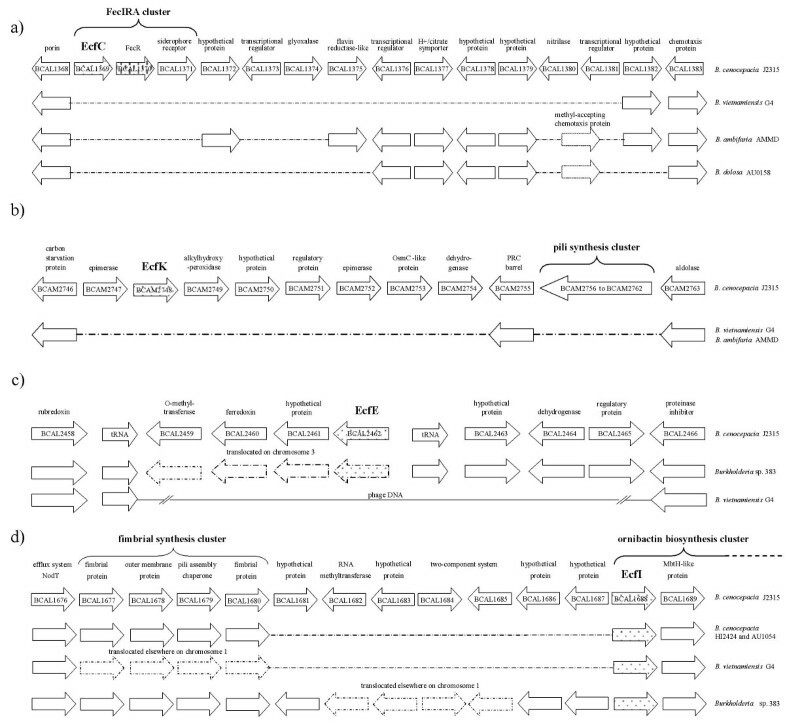 1 could not be used to asses accurately the phylogenetic relationships among each of the main σ70 phylogenetic groups. The phylogenetic resolution of the σ70 family appeared to be more robustly determined by splitting the dataset into two subsets corresponding to ECF and non-ECF (primary, stationary, and stress response/cellular differentiation) deduced σ70 AA sequences. Reliable phylogenetic positioning of Bcen-J2315 deduced σ70 factors was performed by first extracting all AA sequences in the databases showing significant similarities with these factors. These sequences were then added to the multiple alignment obtained by Lavire et al. , and a NJ phylogenetic tree was inferred (Fig. 3). Names of lineages used in Lavire et al. were kept. The NJ tree of non-ECF AA sequences is divided into three major clusters of paralogs, matching the non-ECF categories described in the above section (groups 1, 2 and 3). 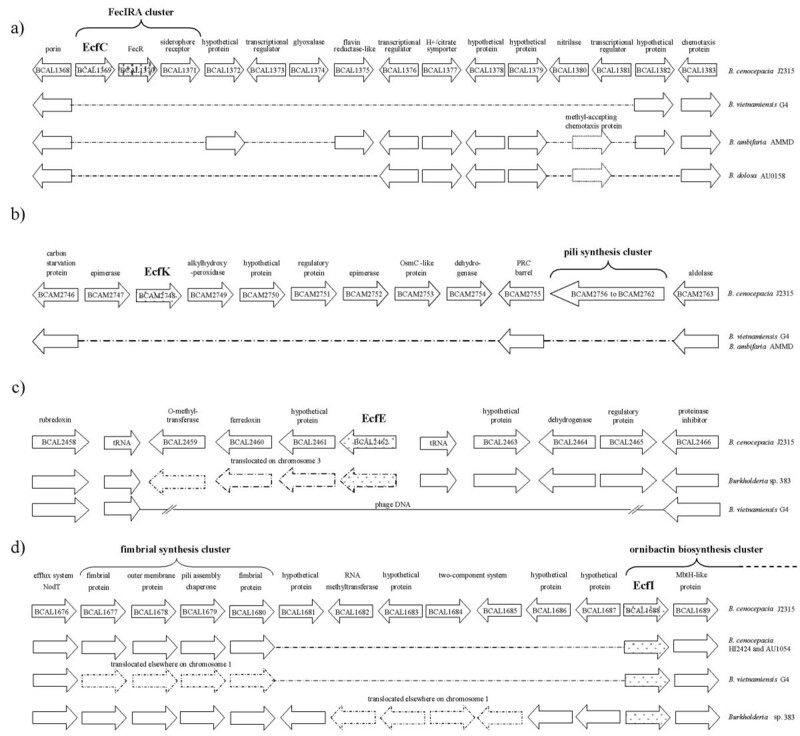 All these paralogous σ70 sequences appear to have emerged early in the evolution of the eubacteria. The SigE/RpoD (group 1), SigM/FliA and SigL/RpoH homologs (group 3) were detected among at least the α-, β-, and γ-proteobacteria, suggesting an emergence prior to the diversification of these bacterial groups. However, the group 2 factors (RpoS) were found restricted to β-proteobacteria and γ-proteobacteria. In the NJ tree of non-ECF σ70 factors (Fig. 3), the group of primary and alternative primary factors was found divided into 7 distinct and significant lineages: C, D and E corresponding to the essential eubacterial primary factors, G and H being representatives of the alternative primary factors lineages of the actinobacteria, and I and J being two novel lineages. 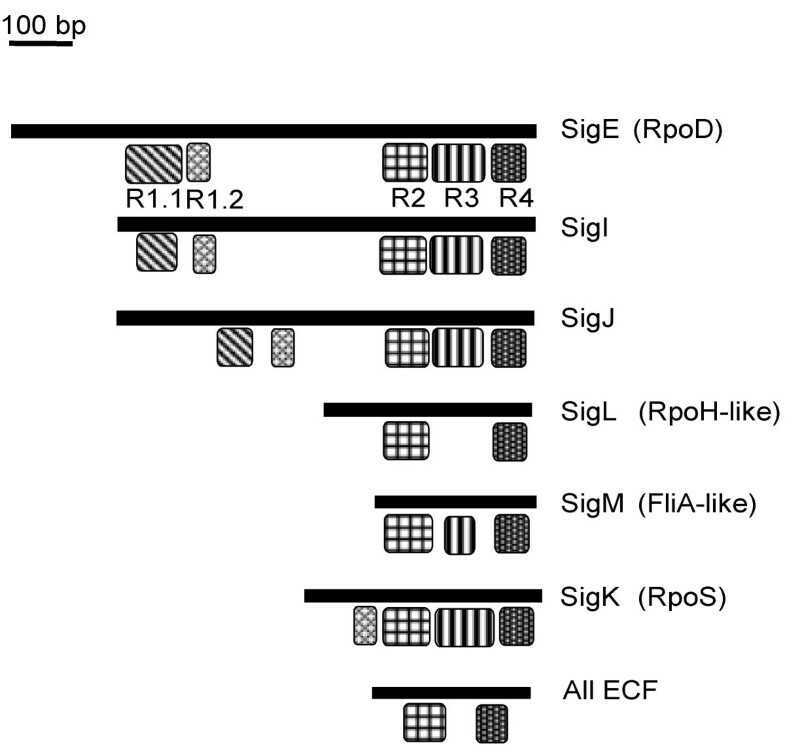 Bcen-J2315 SigE and its Burkholderia orthologs are found to be part of cluster E, the RpoD lineage of essential sigma factors of the proteobacteria, and were thus renamed RpoD. A B. dolosa strain AU0158 RpoD-like sequence appeared distantly related to other Burkholderia deduced RpoD but a closer look at its gene structure showed a frameshift probably due to a sequencing mistake. An additional copy of the rpoD gene was detected in the B. xenovorans genome (Fig. 3). This copy shows a deduced AA sequence significantly different from the ones of the sigE/rpoD Burkholderia orthologs, suggesting either acquisition by an horizontal transfer event or an ancient duplication event prior to the diversification of the β-proteobacteria. Bcen-J2315 SigI and SigJ deduced sequences and their orthologs revealed two novel lineages of group 1 factors which are restricted to the Burkholderia genomes (Fig. 3), and were thus termed alternative Burkholderia primary factors. The sigJ coding sequence was not detected in B. xenovorans and B. cenocepacia PC184 genomes (Table 2 and see section on genomic rearrangements). However, sigJ DNA probings of Bcc genomic DNA blots showed a broad distribution among the Bcc (including B. cepacia, B. cenocepacia, B. stabilis, B. dolosa, B. vietnamiensis, B. multivorans and B. pyrrocinia) (Table 2). sigI was not detected in the genomes of the Bcc strain 383, of B. xenovorans, and of B. pseudomallei and its closely related genomes (see section on genomic rearrangements). Nevertheless, Bcc DNA blot analyses using sigI DNA probes showed this gene largely distributed in the Bcc (Table 2). In B. xenovorans LB400 genome, sigI and sigJ were not detected but another lineage of alternative Burkholderia primary factors was found. The presence of coding sequences of such factors can thus be considered a common feature of Burkholderia genomes. Alternative primary factors were never detected in P. aeruginosa. In fact, this is the first report demonstrating the presence of alternative primary factors among bacteria outside the actinomycetes. The function of these alternative primary factors is unknown but they possess all the domains found among the RpoD factors i. e. -10 and -35 promoter recognition domains, RNA polymerase binding domains, etc (Fig. 2). These factors could be replacing the primary one under growth conditions inhibiting its expression or functioning (potentially certain antibiotics). Burkholderia cepacia complex strains used in this study, and summary of DNA blot analyses of these strains using ecfB, ecfD, ecfE, sigI, and sigJ DNA probes. 32P-random labelling of DNA probes were done as described in the Methods section. See Table 3 for position of the PCR products used for the synthesis of DNA probes. + : positive hybridization signal, - : no hybridization signal (<72% identity). * : hydridization signals varied according to the sigI DNA probe used. (+): these positive signals were only obtained with the Bvi-sigI probe. The group 2 phylogenetic radiation is divided into two clusters (supported by 96% and 97% of the bootstrap replicates, respectively) which match the diversification of the proteobacteria into the β and γ subgroups (Fig. 3). Bcen-J2315 sigK deduced amino acids sequence is clustered with the β-proteobacteria RpoS deduced sequences (and was thus renamed rpoS). In B. cepacia and B. pseudomallei, RpoS was shown to be implicated in oxidative stress response, to be induced by heat shock treatments, and upon carbon starvation [16, 17]. No RpoS-like coding sequence was detected in any α-proteobacterial or other eubacterial genomes. Among the actinomycetes, the stationary phase factors are known to be part of a fifth group of sigma factors which was not considered in this study i.e. the lineage of actinomycetal stress response and stationary phase factors (including sequences like S. coelicolor RpoX, Mycobacterium tuberculosis SigF, etc) [18, 19]. This group is not closely related to group 2. Misleading automatic annotations of several RpoS gene sequences were observed in Borrelia, Bacteroides, Blastopirellula, Rhodopirellula, Moorella or Aquifex genome; their deduced factors did not group in the RpoS cluster (data not shown). To clarify this situation, we suggest the use of the name rpoS only for sequences of the group 2 σ70 factors from the β- and γ-proteobacteria. The restricted distribution of RpoS gene sequences and their close phylogenetic proximity with Group 1 sequences (primary and alternative primary factors) suggest a likely emergence of rpoS from an ancestral group 1 sequence. A duplication of the highly conserved eubacterial rpoD gene probably led to this paralogous group. Alternative primary factors described in the above section might have evolved from similar but more recent duplication events. The emergence of rpoS can be considered a key event in the evolution of the eubacteria. Molecular phylogenies of RpoD (group 1), and FliA-like and RpoH-like sequences (group 3) (Fig. 3) suggest an early diversification of the α-proteobacterial sequences from those of the β- and γ-proteobacterial sequences. This can also be inferred from other datasets e.g. rrs and concatenation of essential proteins . The emergence of rpoS matches the separation of the α-proteobacteria (no rpoS – ancestral state) from the β- and γ-proteobacteria (harbouring rpoS). Group 3 is polyphyletic and divided into two groups, one corresponding to FliA-like sequences, and one corresponding to RpoH-like ones (supported by 100% of the bootstrap replicates). Bcen-J2315 sigM deduced AA sequence belongs to the FliA subgroup, whereas Bcen-J2315 sigL deduced AA sequence groups with the RpoH-like sequences (Fig. 3). A sigM (fliA) homolog was confirmed to be involved in motility among the Burkholderia . Phylogenetic relationships among the ECF cluster are presented in Fig. 4. All database sequences closely related to Bcen-J2315 putative ECF were considered in this analysis. A first round of phylogenetic analysis allowed the identification of all database factors related to Bcen-J2315 ECFs. A second round of analyses was then performed by limiting the dataset to a set of selected sequences representative of the main phylogenetic trends observed. Fig. 4 shows the best NJ tree obtained. Its structure is not supported by high bootstrap values but all sub-groups of ECFs are supported by high ones. EcfA, EcfC and EcfI deduced AA sequences are the only Bcen-J2315 ECF factors having homologs in the P. aeruginosa genomes. Neighbor-Joining phylogenic tree of ECF σ 70 factors. The sequences were retrieved from sequenced Burkholderia genomes or the GenBank database. Within one species, when sequences were orthologs, only one sequence per sigma factor was kept. A total of 746 sites were analyzed (with pairwise deletion of gap-containing sites). Distances are proportional to evolutionary divergences expressed in substitutions per 100 sites. Bootstrap values higher than 85% are given. Distribution among other proteobacterial groups is indicated. Likely role of the identified ECF factors is indicated. EcfA-like deduced sequences are found in several proteobacterial genomes but could not be detected in the ones of α-proteobacteria (Fig. 4). Surprisingly, B. vietnamiensis and Burkholderia sp. 383 deduced EcfA sequences were found to group apart from other EcfA-like sequences belonging to the Burkholderia (Fig. 4); making these sequences closer relatives of a Ralstonia homologous sequence. ecfA encodes a factor highly similar to the well-characterized AlgU factor of P. aeruginosa which is involved in alginate biosynthesis . However, the B. cepacia homolog of EcfA was recently shown not to be involved in exopolysaccharide biosynthesis and onion pathogenicity. It was found involved in the adaptation to heat stress and phosphate starvation . Interestingly, the ecfA gene sequence was found in two copies in the Bcen-J2315 genome. These two copies are harboured by identical 40 kb DNA fragments delimited, on one hand, by an IS element. To trace back the ecfA duplication event in B. cenocepacia, a PCR strategy was built. PCR primers were defined for each hand of the duplicated 40 kb regions containing the ecfA copies (Fig. 6a). PCR products from the B and C primers (Table 3), targeting the duplicated region containing the ecfA2 allele, were obtained for all but the LMG 18863 strain of the ET12 clonal complex; a strain confirmed to be a member of the ET12 clone by PCR screening of the BCESM and cblA loci (data not shown, see ). PCR products amplified with the A and B primers (Table 3), targeting the end of the DNA region affected by the ecfA duplication and its linked chromosomal inversion, were obtained for this latter ET12 strain and the non-ET12 B. cenocepacia isolates. B. cenocepacia PHDC strains (AU1054 and HI2424) and B. cenocepacia PC184 genomes harboured only the ecfA1 allele. The ET12 LMG 18863 strain, which was not found to harbour the 40 kb ecfA-duplicated region, could have either reverted to its previous genetic organization or could be a more ancestral representative of the ET12 clonal complex. These data suggest that duplication of the ecfA 40 kb locus could have contributed to the radiation of the ET12 complex. Syntheny analysis of B. cenocepacia strain J2315 ecf genomic regions showing rearrangements in other Bcc sequenced genomes. (a) ecfC, (b) ecfK, (c) ecfE, and (d) ecfI genomic regions. Bcen-J2315 concatenated genome was compared to other Bcc sequenced concatenated genomes using ACT . Bcen-J2315 ORF annotations were assigned using other annotated Burkholderia genomes. ORF numbers assigned by the Sanger Institute are indicated. Dashes indicate missing regions. Phage DNA in (c) indicates a potential phage insertion. Arrows indicating ORF of sigma factors are filled with dots, and of anti-sigma factors are filled with vertical bars. The ecfA ( rpoE ) gene duplication. (a) PCR analysis of the duplicated 40 kb ecfA region among Bcc genomes. Strains used are described in Table 2. PCR primers are presented in Table 3. The DNA size marker is shown. Orientation of the PCR primers is indicated in the b and c sections. B/C primers detect the Bcen-J2315 configuration (duplication event)-ecfA2 allele, and A/B primers detect the Burkholderia sp. 383 configuration (no inversion). (b) and (c) Promer plot comparison of Burkholderia sp. 383 chromosome 1 against either (b) Bcen-J2315 chromosome 1 or (c) the partially inverted Bcen-J2315 chromosome 1. inverted region #1 an inverted region #2 of Bcen-J2315. ISBcen8 position is indicated. Promer analyses were performed according to . PCR primers used in this study. Bcen-J2315 chromosome 1, was compared to chromosome 1 of Burkholderia sp. 383 using the Promer tool according to . This tool provides large scale DNA sequence analysis. ORFs were automatically detected and similar ones were plotted on Fig. 6b. 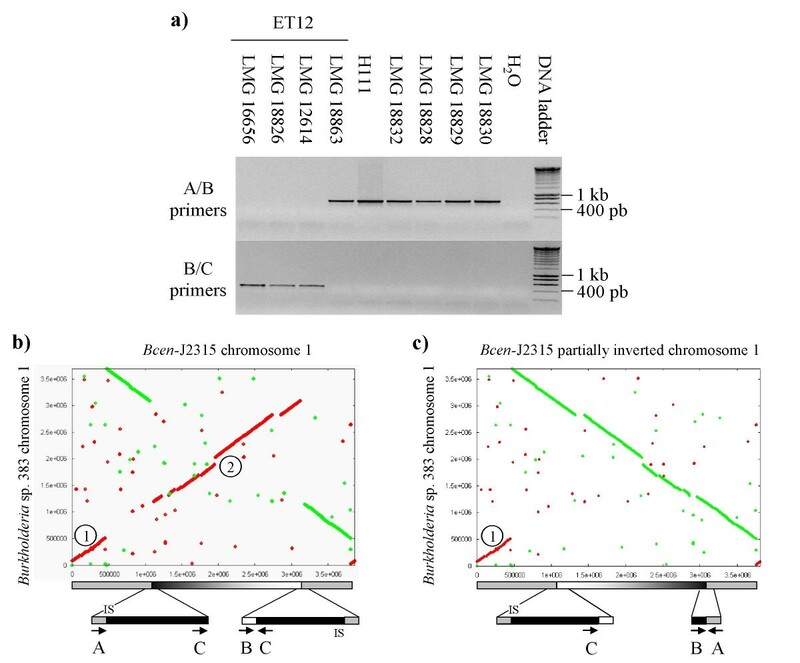 This analysis detected two inversion events on these chromosomes. To determine the role of ecfA-40 kb region in these duplication events, the chromosome 1 region was inverted manually between the two 40 kb duplications and compared with Burkholderia sp. 383 chromosome 1 (Fig. 6c). In this way, only the first inversion is detected, indicating that the 40 kb duplication was implicated in the large scale inversion of Bcen-J2315 chromosome 1. One border of the 40 kb duplication was found to harbor an Insertion Sequence (IS) named ISBcen8 according to the IS Database . This IS could have played a role in the duplication event that led to the inversion of an important part of chromosome 1 of ET12 strains. This insertion sequence is found (with at least 99% identity) in seven copies on chromosome 1, two copies on chromosome 2, and 3 copies on chromosome 3. The ORF encoding the transposase of this IS was identified with ORF finder and confirmed by GC skew analysis. IS492 from the IS110 family (ORF: 34% identity, 52% similarity) was found to be the closest phyletic neighbour of this IS. In several species such as P. aeruginosa, Salmonella typhi or Bordetella pertussis, genome rearrangements were found associated with infectious outbreaks [27–29]. Hughes et al. suggested that rearranged genomes could allow to overcome the immune system of the host. The ecfA 40 kb locus could thus have contributed to the emergence of the hyper-virulent ET12 infra-specific clonal complex by driving a large scale inversion of chromosome 1. This ECF lineage has a broad distribution (Fig. 4). Related genes could be found in the α and γ-proteobacteria. ecfB DNA probings of Bcc genomic DNA blots confirmed its large distribution in the Bcc (Table 2). The deduced EcfB protein is phylogenetically closely related to PrtI which is involved in a temperature dependent regulation of certain proteases . However, no gene at the proximity of ecfB was found to encode a protease in Bcen-J2315 and other Burkholderia genomes. Such a situation was also observed for the PrtI-like locus of the P. putida genome . ecfB could thus be involved in temperature dependent regulatory processes but seems to have been recruited for the regulation of other protein families than proteases. The ECF NJ tree (Fig. 4) shows Bcen-J2315 deduced EcfI sigma factor to group with the PvdS factor from Pseudomonas aeruginosa, and the EcfC deduced factor to group with FecI-like factors. EcfI was previously shown to be involved in siderophore (ornibactin) biosynthesis  (EcfI being named OrbS in this latter article). Here, it is found to have a broad distribution (Fig. 4). FecI was shown to be involved in the regulation of iron dicitrate uptake in E. coli . In other bacterial species, the fecIRA system can regulate iron uptake by other siderophores than citrate . 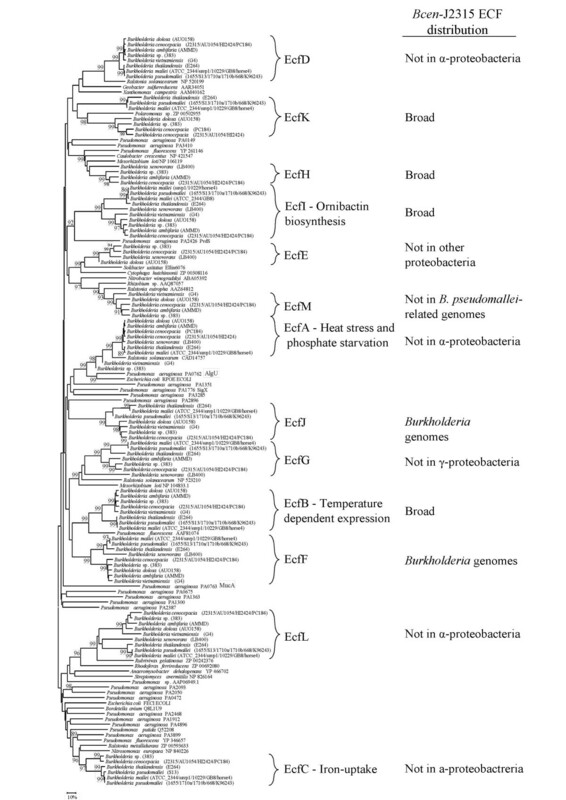 Phylogenetic analysis of EcfC/FecI homologs suggests an emergence of this particular sub-group after the diversification of the α-proteobacteria (no fecI homologs) from the other proteobacteria. Interestingly, FecI-like factors represented 26% of P. aeruginosa deduced ECF factors, and 68% of those of P. putida . Among P. aeruginosa and P. putida, these systems were all physically linked to genes involved in the synthesis of outer membrane siderophore receptor proteins. The high numbers of FecI paralogs in these two pseudomonads were considered indicative of a shared ability at colonizing certain niches that require distinct iron uptake systems or particular interactions with siderophores . In the case of the Bcc, a single FecI-like factor was detected. The ecfC gene, encoding this factor, was found physically linked to fecR- and fecA-like gene sequences. FecI can interact with FecR to activate the fecABCDE operon involved in the transport of extracellular Fe(III)-citrate complexes to the cytoplasm. FecR interaction is modulated by FecA which will activate the FecIR interactions after perception of Fe(III)-citrate complexes. TBLASTN searches using FecR were performed on selected Bcc genomes to ensure that no FecIRA-like system was missed during our analyses. These searches did not detect any other FecIRA system in Bcen-J2315, B. vietnamiensis, B. dolosa, and B. ambifaria genomes. Other TBLASTN searches using HemO, CirA, Has, HxuC, and P. aeruginosa SigX, FiuI, PigD, and PupI-homologs were performed to complete this analysis. None of these BLAST searches revealed novel coding sequences involved in haem- or iron-uptake  in Bcen-J2315. Interestingly, B. cenocepacia was recently shown able to get its iron from ferritin by proteolytic degradation of this iron-binding protein. B. cenocepacia is apparently the only known pathogenic bacteria able to use ferritin as an iron source . The iron uptake strategies selected by P. aeruginosa and the Bcc are thus quite different; with P. aeruginosa showing a greater versatility in ECF regulated processes. The physiological processes involving these regulatory factors remain unknown. However, their distribution and evolutionary history reveal several observations suggesting that they play significant roles. EcfD is grouping with ECF factors deduced from genomes of other proteobacterial groups (γ and Δ) but not α-proteobacterial ones. ecfD DNA probings of Bcc genomic DNA blots showed a large distribution in the Bcc (Table 2). EcfE is not grouping with ECF factors from other proteobacteria but is closely related to σ factors found among Solibacter usitatus and Cytophaga hutchinsonii. ecfE DNA probings gave positive hybridization signals on B. cepacia, B. cenocepacia, B. stabilis, B. dolosa and B. pyrrocinia genomic DNA blots (Table 2). However, restricted genomic DNA from all strains of B. multivorans and B. vietnamiensis, tested in this study, did not yield positive hybridization signals with the ecfE probe. Phage DNA might have played a role in the loss of ecfE in these bacterial species (see section on genomic rearrangements). Surprisingly, the ecfE deduced AA sequence of B. dolosa AU0158 was found distantly related to other homologs of the Bcc. EcfG is significantly grouping with σ factors deduced from other β- and α-proteobacterial genomes but not with γ-proteobacterial ones. In this case, a deletion of ecfG-like sequences probably occurred early in the evolution of the γ-proteobacteria. Concerning the deduced AA sequences of ecfK and ecfH coding regions, homologs could be detected in genomes of the three main proteobacterial groups (α,β, and γ). Bcen-J2315 EcfH deduced homologs were mainly found in genomes of α-proteobacteria but a sequence was also detected among one γ-proteobacterial genome, the one of Pseudomonas fluorescens. ecfH was not detected in the B. vietnamiensis G4 and B. ambifaria AMMD genomes (see section on genomic rearrangements). EcfK homologs were found in other Burkholderia genomes and in the one of a species of Polaromonas, which is also part of the β-proteobacteria. ecfK was not detected in the B. vietnamiensis G4 and B. ambifaria AMMD genomes (see section on genomic rearragements). EcfL is clustered with ECF without any known function but encoding a TPR (Tetratricopeptide repeat) motif involved in protein-protein interactions. This motif is not found in EcfL and its related Burkholderia ECF factors. In fact, deduced EcfL-like sequences retrieved from B. ambifaria AMMD, B. cenocepacia PC184 and B. pseudomallei 668 genomes are misleadingly annotated with a TPR repeat motif in the databases. EcfL coding gene sequences are found in the genomes of the actinobacteria and proteobacteria with the exception of the α-proteobacterial ones. EcfM deduced orthologs were found among most proteobacterial sub-groups with the exception of B. pseudomallei and closely related species. EcfF and EcfJ are distinct deduced σ70 factors which do not group on the NJ tree (Fig. 4) with any of the previously described ECF sigma factors available in the databases. They can thus be considered Burkholderia-specific. However, ecfJ was not detected in the genome of B. xenovorans LB400. The processes making use of these ECF factors remain unknown. Inside the Bcc, syntheny analyses of the σ70 genetic loci were performed using ACT . Some of these results are shown in Fig. 5. sigE, sigL, sigM, sigK, ecfA, ecfB, ecfD, ecfF, ecfJ, ecfL and ecfM genetic loci were conserved over at least 10 kb (upstream and downstream) among the tested Bcc genomes. ecfB is located 5,5 kb upstream ecfM. sigI, sigJ, ecfC, ecfF, ecfG, ecfH, ecfI, and ecfK loci were affected by various genomic rearrangements. ecfA, ecfB and ecfF are physically linked to anti-sigma gene sequences. Three major categories of genomic rearrangementswere defined, one leading to a loss of a sigma gene through unknown processes, one leading to a loss of a sigma gene through integration of phage DNA, and one leading to a reorganization of the genetic environment surrounding the sigma gene. In this category, in one instance, a very precise deletion of a sigma gene and its respective anti-sigma was observed. This situation was observed for ecfG and its anti-sigma in the B. vietnamiensis G4 genome. However, in most instances, the loss of a sigma gene was concomitant to the loss of important pieces of DNA. sigI and sigJ are, in fact, found deleted in respectively Burkholderia sp. 383, and B. cenocepacia PC184, and the extension of the deleted regions were respectively of 20 and 150 kb. Loss of ecfH in B. vietnamiensis G4 and B. dolosa AU0158 genomes were also associated with the deletion of a DNA region (9 and 12 kb, respectively). In the case of the ecfK locus, which is found at the proximity of a pilus synthesis cluster and genes involved in the synthesis of an alkylhydroperoxidase (Fig. 5b), its deletion involved a loss of about 7 kb in the genomes of B. vietnamiensis G4 and B. ambifaria AMMD. Interestingly, the configuration of these latter deletions were identical in these two genomes, suggesting that it had either occurred prior to the separation of these bacteria into two distinct species or involved similar processes. ecfC deletion event was observed among several genomes but the extent of the deletion events was variable. Nevertheless, one border was always conserved. ecfC (fecI-like) is deleted in B. vietnamiensis G4, B. ambifaria AMMD and B. dolosa AU0158 genomes (Fig. 5a). Part of the deletion concerned genes involved in iron-uptake. These genomic rearrangements of the ecfC genetic cluster could explain the differences observed between B. cepacia and B. vietnamiensis in response to iron starvation. B. vietnamiensis was only found to produce ornibactin under iron starvation while B. cepacia clinical isolates could also produce pyochelin and cepabactin . Among the B. ambifaria and B. dolosa ecfC loci, 4 to 6 ORFs, over the eleven likely involved in iron-uptake in Bcen-J2315, were found conserved. One of these was found encoding a citrate symporter involved in the transport of Fe(III)-citrate complexes. To our knowledge, it is not yet known if B. ambifaria and B. dolosa ecfC loci are functional. Concerning this second category, syntheny analysis showed the Bcen-J2315 ecfE region to have been modified by the integration of phage DNA in B. vietnamiensis strain G4. In this genome, ecfE and an overall 5 kb region are replaced by phage DNA. All genes upstream the tRNA gene of the ecfE region are conserved. The loss of ecfE in B. vietnamiensis was confirmed by DNA blot analyses (Table 2). All restricted genomic DNA of the B. vietnamiensis strains tested did not show any DNA hybridization with an ecfE probe. Similarly, no positive hybrization signal could be obtained on B. multivorans DNA blots (Table 2), while positive signals were obtained for the other Bcc species. 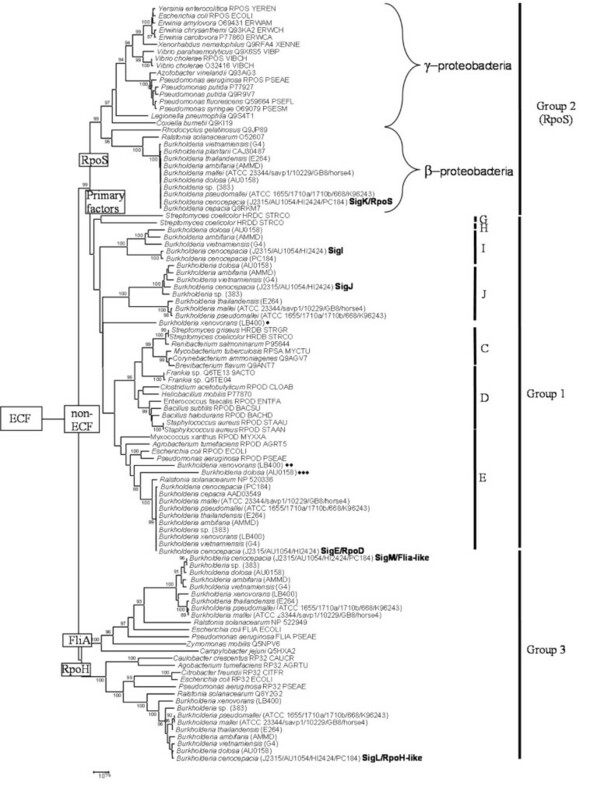 It is not known if the integration of phage DNA was involved in the deletion of ecfE among the B. vietnamiensis and B. multivorans strains analysed by DNA probings. However, we consider that this is highly probable. Concerning this third category, two cases were observed. One concerned the ecfI (pvdS homolog) region, and the other one the ecfE region. Regarding ecfI and its related genetic cluster, the ornibactin biosynthesis cluster, genes upstream ecfI are found deleted in B. vietnamiensis G4, B. cenocepacia HI2424 and AU1054 genomes, and translocated elsewhere in the Burkholderia sp. 383 genome. Genes involved in fimbrial synthesis, and the synthesis of a two component system were partly affected by these rearrangements (see Fig. 5d). Similarly, the ecfE region and three of its neighboring genes proximal to a tRNA gene sequence in B. cenocepacia J2315 chromosome 1 were translocated into a distinct region of the genome of Burkholderia sp. 383, while all other genes were kept in place (Fig. 5c). This paper was dedicated to the analysis of the σ70 gene family, its architecture and plasticity, through an analysis of about 20 genome sequences of the eubacterial Burkholderia genus. Emphasis was made on a bacterial group of this genus which is named the "Burkholderia cepacia complex" or Bcc. Several epidemic clones have been described in the Bcc, including bacteria responsible of the "cepacia syndrome", a dramatic necrotizing pneumonia. The great versatility of these Bcc species could be linked to an important diversity in regulatory processes including those of the σ70 gene family. The σ70 gene family is widely distributed among the eubacteria, and probably emerged early in bacterial evolution. Duplication events led to the emergence of several Bcc σ70 paralogs which were found limited to certain bacterial groups like the proteobacteria, Burkholderia, the cepacia complex, and particular Bcc species or strains. This gene family was found to be under strong selective pressures that could lead to acquisition/deletion (ecfE, ecfG, sigI, sigJ, ecfC, ecfH, and ecfK), and duplication events (ecfA and rpoD) modifying its architecture. These changes are likely to be key events in Bcc evolution, generating novel gene expression profiles that could be more suited for the colonization of particular biotopes including the respiratory tract of CF patients. A key conclusion was that the comparative analysis of the σ70 gene architecture of Bcc species and of Pseudomonas aeruginosa, a species found in similar habitats including CF lungs, revealed distinct evolutionary strategy, with the Bcc having selected several alternative primary factors, something not recorded among P. aeruginosa and only reported to occur among the actinobacteria. Only three ECF paralogs (FecI-like, PvdS and AlgU) were found in common between the Bcc and P. aeruginosa. The next step in these studies will be to investigate the impact of gains and losses of σ70 determinants in the ecology of the Bcc and the colonization of the CF lungs. TBLASTN searches of B. cenocepacia J2315 genome were performed using the Wellcome Trust Sanger Institute web site . The following ten σ70 factors were used for these searches: RpoD (accession #AAA24601), RpoS (#CAA34435), RpoH (#AAA24587), SigF (#AAA22788), FliA (#BAA00389), AlgU (#AAC43714), CnrH (#AAA21967), HrpL (#AAD00805), PpuI (#CAA54870), and RfaY (#AAA92044). All loci encoding putative proteins showing good similarities with the target proteins were analysed by FramePlot , ORF finder  and testcode . BLASTP analyses of the deduced ORF proteins were performed . Conserved domains among sigma factors were detected using CDD 2.02 . To achieve saturation in the detection of σ70 factors, identified putative factors were concatenated and the resulting sequence compared to Bcen-J2315 chromosomes using ACT. This graphical tool allows visualisation of a BLAST comparison of two sequences. A TBLASTN was performed using Bcen-J2315 chromosomes as the database and the concatenated sigma sequences as the query. Visual identification of DNA regions showing similarity with different sigma factors was performed and candidate ORF were analysed as stated above. Multiple alignments were computed using CLUSTALW . Distances between sequence pairs, the inferred phylogenetic trees, and bootstrap values were all computed through the Mega3 graphic tool . Phylogenetic trees were built using the Neighbor-Joining (NJ) method . Bootstrap replicates were performed using 1000 replicates. Gap containing sites were deleted globally or by pair of sequences. Alignments can be downloaded using the UMR5557 http server [46, 47]. Strains used in this study are listed in Table 2. Bacteria were grown in LB (Luria-Bertani)  broth at 30°C. DNA extractions were performed as previously described . PCR amplifications (25 μl) were done according to the Taq polymerase manufacturer (Invitrogen, Cergy Pontoise France) without 1% w-1 (detergent) but 1,25 μL of DMSO. PCR primers are indicated in Table 3. PCR cycles using total DNA were as follow: (1) 95°C for 5 min, (2) 95°C for 30 sec, selected annealing temperature for 30 sec (see Table 3), 72°C for 30 sec (35 cycles), (3) 72°C for 5 min. Genomic DNA blots were performed on Genescreen (USA) nylon membranes following . The DNA (5 μg) was digested with Eco RI (Fermentas) at 1 U/μg DNA, for 16 h at 37°C. DNA probes were labelled using the random priming labelling kit (Amersham-Pharmacia, Orsay-France). DNA hybridizations were carried out according to the nylon membrane manufacturer (Genescreen, USA). Membranes were hybridized and washed at 65°C. Autoradiography was performed according to . We thank the CNRS, Université Lyon1, and Rhône-Alpes Region (France) for their financial supports. AM was allocated a Ph. D. scholarship by the Ministère de la Recherche et de l'Enseignement Supérieur (France). AG was allocated a Ph. D scholarship from the «Cluster Environnement» of Rhône-Alpes Region (France). We thank the Sanger and Joint Genome Institutes for having made available Burkholderia genome sequences to the scientific community. AM performed computer and molecular analyses, had significant inputs in the conception of this work, and drafted parts of the manuscript. PEDLS and AG helped performed computer and molecular analyses, and made substantial contributions in the acquisition of data. BC conceived the study, designed the experiments, participated in most analyses, coordinated the work, and drafted the manuscript. All authors read and approved the final manuscript.